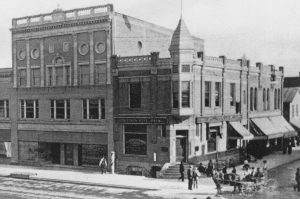 Highpoint Community Bank was founded as Hastings City Bank in 1886 when 35 Hastings investors provided the initial capital of $50,000. At the time, we served the town and community of Hastings with its economy driven mostly by sawmills. As our bank grew through the years, we expanded into Middleville, Caledonia, Nashville, Bellevue, Wayland, and Marshall. Although our main branch and corporate headquarters remain in downtown Hastings, we felt the need to update our brand to better reflect the various communities we serve. Regardless of what our name is, HCB will always stand for a better banking experience. We are now Highpoint Community Bank, with the same people who smile every time we see our customers, friends and neighbors. We stand behind our communities the same as we always have, supporting local financial literacy programs, providing scholarships to local students, and encouraging community volunteering time for all our employees. We believe in celebrating all the high points in life, and we’ll do whatever we can to help you reach your goals. After more than 130 years, our focus is still on delivering the excellent customer service that has been our hallmark since 1886. Elevating communities and raising expectations. Highpoint Community Bank. This way up.